I was at a craft fair recently and over the course of three days, I heard several women comment, I’d wear that as a scarf, as they fingered a kitchen towel. I’ve heard this and similar comments frequently over the years. Even after all this time, I struggle to respond, feeling like it’s not okay to say what I long to say. I choose to take comments like these as a compliment – an affirmation that I’ve woven something beautiful. At the same time, I feel a deep sadness that they would deny themselves the experience of drying their hands on these towels. It’s such a satisfying tactile experience. 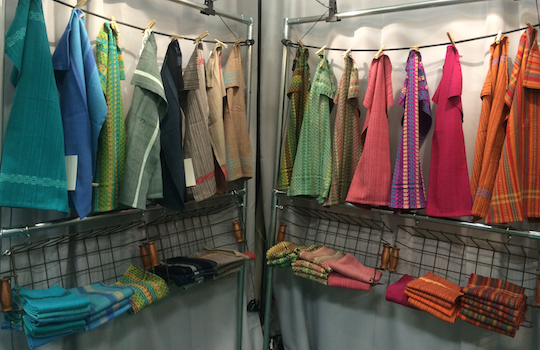 At the vast majority of craft fairs I’ve been at, I’ve been the only weaver selling kitchen towels, so I understand when someone assumes that the handwoven textiles hanging in my booth are scarves. Still I wonder why choose a beautiful handwoven scarf and not a beautiful handwoven kitchen towel. Why not dress your everyday life as beautifully and delightfully as you adorn your body? I’ve had enough conversations about kitchen towels to know that in many kitchens, towels are used for dirty work. To wipe spaghetti spills off the counter or clean up soup splatters from the stove top. I’ve also spoken with enough friends and customers to know that a handwoven kitchen towel can make a profound difference in daily life. “As women we’ve been taught to adorn our bodies. Our clothes are an expression of who we are, our style. They affect how we feel. We choose scarves that make us feel beautiful when we drape or tie them around our neck. We smile when we walk into the office and someone says, That scarf looks great on you. “But are we only looking for outside praise? “Even though no one says, Wow, Mary, I can tell you dried your hands on a beautiful towel this morning, please consider that a kitchen towel is also an expression of who you are. It, too, has the power to affect how you feel. You have an intimate relationship with a towel, holding it, touching it repeatedly throughout the day. “This towel you’re looking at was woven to bring you joy, beauty and nourishment as you go about daily life. To make you smile when you enter the kitchen and see the pop of color hanging on the cabinets. To make drying your hands a satisfying tactile experience. To feed your soul as you care for yourself and others. “The small tasks of everyday life – cooking meals, washing dishes, doing laundry – have become undervalued. Yet they’re an important part of how you care for yourself and others. Giving attention to and beautifying these tasks is a way to nourish yourself throughout the day. When you integrate small moments of self-care into routines, you’re less likely to become depleted. “If you’re worried about getting the towel dirty, please set aside those concerns. Please trust it’s really okay for this towel to get dirty. Life is messy after all and anything, even scarves, can get stained, broken, chipped, dented or cracked. That doesn’t mean that the things you use every day shouldn’t be beautiful. Far from it. 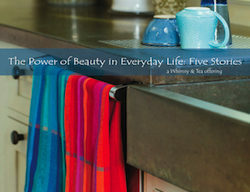 “Besides this towel was woven to be the workhorse of your kitchen. It can take a beating. It holds up well with repeated washing and gets softer with use. “Please breathe what I’m saying into your body, into your being: this towel is my gift to you. It’s an opportunity to dry your hands on a cloth that is deliciously soft, remarkably absorbent and durable, and most of all, beautiful. An opportunity to slow down, step into the moment of what you’re doing, and be present with your life. An opportunity to feel as special and unique as if you were wearing a handwoven scarf. As someone who owns a table runner you created I deeply appreciate using the table runner and get a great deal of pleasure looking at it daily (I often work at the dining room table on which I put the table runner). At the same time I can understand the desire to put something beautiful near my face so I can enjoy it in that way as well. Clothing and accessories that make me feel beautiful have a special magic of their own. From my perspective it’s not so much that I am denying myself the experience of using something beautiful for everyday work at home as it is to enjoy that item in a different and very gratifying way. Perhaps some of the comments you heard came from that perspective? As always I appreciate you and your work! As always, I appreciate your comments, Judy. Thanks for sharing a different interpretation or perspective on the comment “I wish it were a scarf.” Maybe at the next show, I’ll have the courage to ask someone! I agree that clothes and accessories have their own special magic, and I think we are more attuned to how clothes make us feel beautiful than we are to the ability of everyday objects to also make us feel beautiful. I really like this idea, Marilyn! Something I’m going to pay more attention to. I’d love to hear what you discover as you pay attention, Judy. Well said, as always. You are a beautiful writer. Perhaps because I am a maker, or a craftsman, I feel just as you do that my “things” and my surroundings are so important. They make me happy and they make me smile. We’ve been repainting the house since we moved in 3 years ago and a friend asked when I would ever be done! First answer is when every wall has been repainted. Second answer is “I don’t know!”. We’ve moved every 4 years or so, so I have never had the time to be finished. And I’ve been making “things” for the house since we were married. Useful things and pretty-to-look-at things. Speaking of that – I am going to wash my dish towels today! I am so excited to see how they come out of the washer and my husband is anxious to “get them dirty!”. I think making a home is an ongoing process so even if you do manage to repaint all the walls before moving again, maybe you still won’t be “finished”! I hope you are pleased with your towels and that your husband has fun getting them dirty. I’ve been weaving dishtowels for the members of my sewing group and they seem to love them but all say, “I could never use it”! I think I’ll just print off this wonderful post of yours, and include it with the gifts! I apppreciate you including this post with the gifts for your sewing group, Kerry. I hope it encourages them to use your handwoven kitchen towels. Loved your comments about handwoven towels and since our guild is involved in a towel study group this year, I’ve posted a link to this article on our blog. I’m glad these comments spoke to you, Beryl. I appreciate you sharing this with your guild.